“The experience is unsurmountable” says former Army Sargent Kelah Raymond, war veteran who now works in the corporate world. We talked to Kelah during a morning sail with the Sailing Angels organization. Sergeant Raymond affirms that the majority of “Modern” war veterans are not older than 29 years old. However, on this morning’s sail there was a much older veteran whose presence reminded her of her own father. Kelah’s father was an ex-marine that overcame addictions caused by combat experiences and extended separation from loved ones. “The sooner the healing begins, the sooner you are healed” said Kelah. Helping in this healing process is precisely the reason why Kelah decided to become a volunteer with Sailing Angels three years ago. “With vets, I speak their language,” said Kelah. 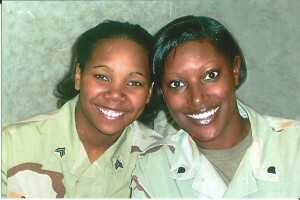 Her ability was acquired through her military experience and also through her work in corporate human resources. She relates to them as they share their battlefield memories in the middle of a calm morning sail. Kelah feels peace and serenity in them as they share their experiences. Kelah Raymond’s transition to civilian life was relatively simple, she affirmed. 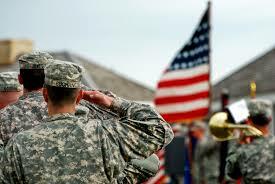 And now from her current position she can help veterans in their process of assimilation into civilian life. They bring leadership to the corporate world, the discipline to execute without questioning; they get the job done even when they disagree. “They collaborate, foster camaraderie, have a high sense of loyalty, they’re open to diversity, and perform well in dangerous situations. All this makes them exceptional employees,” said Kelah. 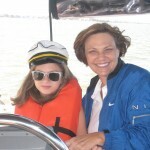 Kelah, through her corporate job and her volunteer work with Sailing Angels contributes her “Grain of sand” to help veterans heal and move forward in the same process she experienced. “I’ve walked in their shoes and so I get it,” Kelah concluded. The military personnel and veterans in Project Victory’s brain injury rehabilitation program are benefiting from a unique program that is literally setting sail to their therapy. 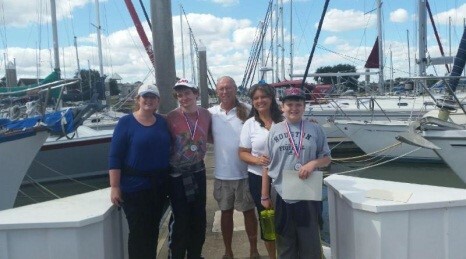 The nonprofit organization is powered by volunteers who provide recreational therapy through sailing for individuals with cognitive and motor deficits. 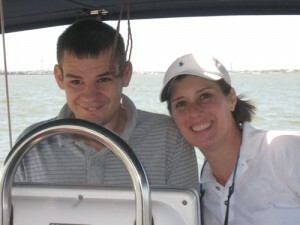 Christine Wiegman, Project Victory Social Worker, and Michael Furtado, Physical Therapist, have accompanied Project Victory clients on numerous outings with Captain Dave McCabe. Day sailing excursions with Captain McCabe have proven highly beneficial for the men and women participants in project Victory. Christine Wiegman said, “The experience of sailing helps our clients practice relaxation strategies that decrease their stress response and anxiety. The rhythmical movement of the boat and reduced noise create a calm environment that is difficult to replicate to an activity filled rehabilitation center. 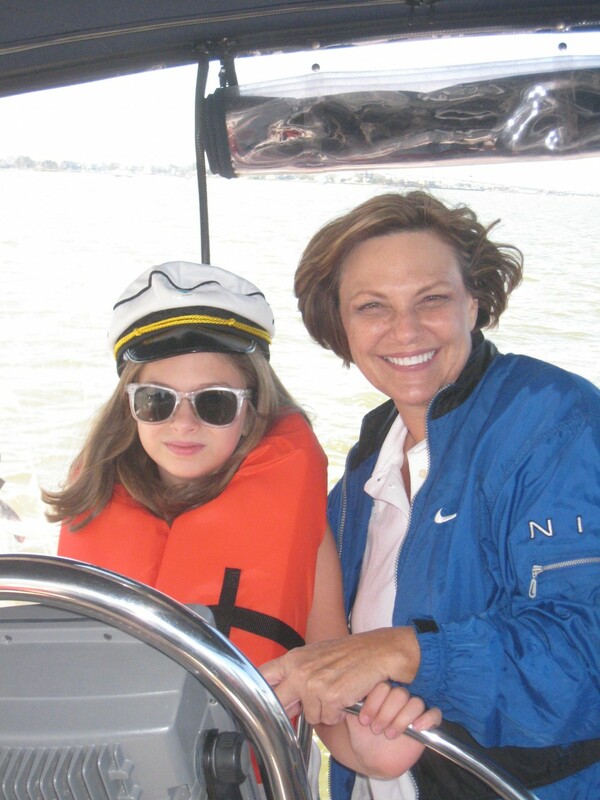 The sensory stimuli created by a boat as it moves through the waves and changes course with the wind also helps mediate balance deficits often experienced by individuals who have sustained a brain injury. When our clients ambulate around the boat, hoist a sail, or take the helm, they’re integrating their visual field with their physical environment to remain balanced.” The benefits of sailing as a recreational therapy go beyond balance, coordination, and relaxation. There is a lot of teamwork, communication, and social interaction involved in sailing. Everyone had an extraordinary time! You all are providing such an amazing opportunity for families like ours. On a side note: I have never, ever seen my boys so relaxed and focused. Especially my younger son, Noah. 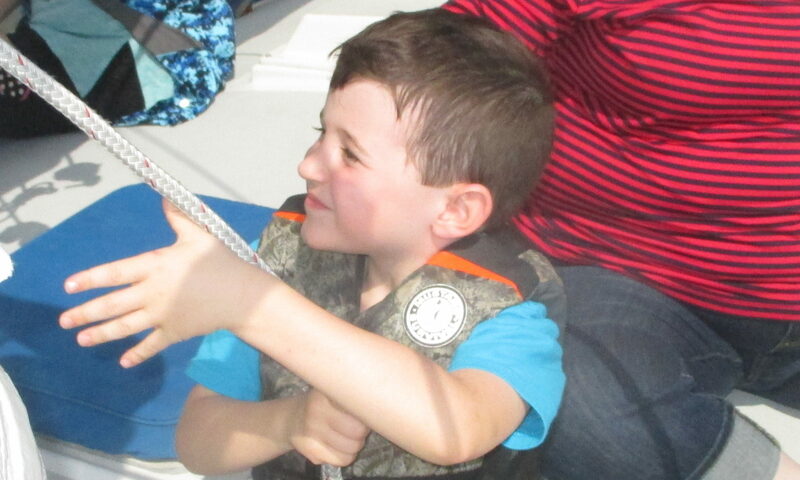 He was so focused and thrilled about sailing that boat! And, to see my older, Cameron to not be consumed with anxiety was also extraordinary! I cried tears of joy with my husband when I told him about our day. Thank you again, for providing such a wonderful day of sailing!! “As 2014 comes to an end, I can’t help but reminisce what this year has brought us…. Health, trips, toys, family, friends… But above all JOY! Eight years ago, my son Joshua was diagnosed with Down Syndrome, a chromosomal disorder that I knew nothing about except that I knew my son would do many of the things doctors said he wouldn’t. 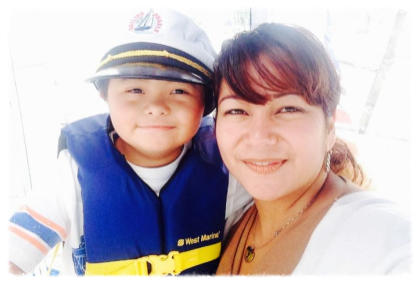 “One of the wonderful people that has touched our lives is Capt. Dave. He is not a captain of the biggest vessel you can think of… but he does have one of the biggest hearts! Joshua has been sailing with Captain Dave for about 2 years now; he has been able to drive the boat, wear the captain’s hat and even raise the sail! Joshua has been able to do many of the things that doctors said he wouldn’t. 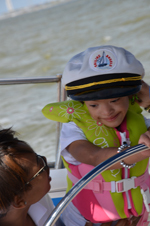 “My daughter Maisie who is 5 years old and has Down Syndrome, had an opportunity to take part in a sailing trip with The Sailing Angels Foundation. This was a once in a lifetime experience and one of the most amazing experiences for her as well as myself. I wasn’t sure of how to prepare Maisie for the trip but figured she would have a good time on the water and boy was I right! Once we got situated in the boat and was ready to launch into the water, Maisie started singing “Row, row, row your boat.” This really took everyone by surprise because she start singing a very fitting song and it was a song that I didn’t even know she knew. We all joined in and sang it with her as we happily sailed away in the water. 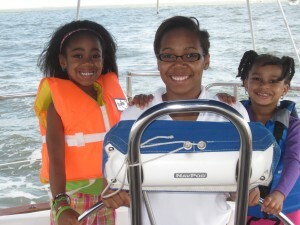 We had such a wonderful time during our sail. 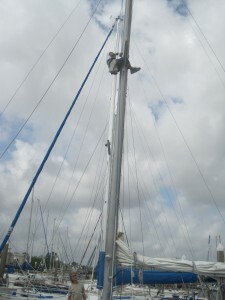 I loved steering the boat and helping to rig the sails!